Being in a relationship for 7 years brings a lot of ups and downs that make us stronger and more mature. Now, frankly, this marks the first time that I share something deep and legit from the heart. Bear with me if this goes more dramatic than expected. Hope you enjoy this one! Whenever people ask how long we’ve been together, and we answer honestly. These three (3) sentences are the top reactions that I personally observe that people say whenever they learn about the years. It doesn’t bother me at all as it makes me feel amused at people when they ask that. Nowadays, if you notice, more short-term relationships exist just because of so many factors. 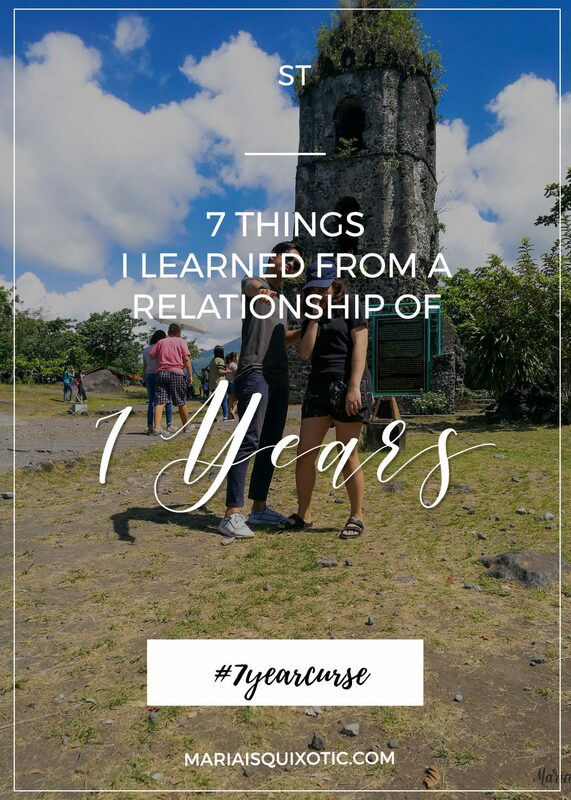 How much these 7 years have taught me? Long story short, these seven (7) years teaches a lot and helps me grow into a better person. Moreover, I learned to discover and unlock different levels of closeness and improve my communication skills as well. Before, I struggled on how to communicate and share my deepest thoughts since I always felt people judged me whenever I spoke freely or tried to talk to them honestly. But now, I’ll discuss everything in detail. At Tierra Alta, for our dear friends’ wedding. One of the secrets for a relationship to flourish, communication. It helps you speak freely to each other as long as you don’t insult or humiliate one another. Arguments come and go in a relationship. Both need to remember that when you make a decision, don’t make it while you’re mad. If you do, you’ll surely regret it. When communicating your most honest thoughts, remember to be true to yourself without stepping on your partner or even other people. Sometimes, we use words that we think won’t hurt them but they still do. Reassure them that your message might be misunderstood and let them clearly understand how you truly feel and why you feel that way. Respect – a very big word that entangles with other words and factors in a relationship. While I’m the extrovert, he’s the introvert and sometimes when we get irritated with some things, we respect each other to enjoy some time alone. Sometimes, when I get pissed at the world, I just shut down and go to my room and I just read or need space. In turn, when he feels the same, I give him time and space also. When both of you feel agitated or triggered by something else, don’t lash out on your partner or anyone around. It will create a gap or worse, sever your ties with them. Walk away for a bit, cool your head. Afterwards, talk to them when you’re calm and ready to iron out things. A date happens when the two of you go out to someplace else. Most people think that dates need to be extravagant or always in a luxurious place. I realized with us that even if we’re just eating street food, it’s still a date. Surely, you wonder why. It’s simple really. Wherever you may be, as long as you’re together and having a good time, it’s a date! However, there’s nothing wrong with always going to malls or other places. That’s your choice. What I mean here, a date can be anywhere as long as you’re together. Trivia: When we eat street food, we just spend around 100-150. That’s just either parking fee or Grab fee or even gas money to some. Truth be told, I saw those memes that show different personalities whenever you’re with different kinds of people. It just struck me down to the core because it proclaimed the truth. Well, at least to me. Being the only child in the family, relatives usually put me on the hot seat during gatherings. They ask me about certain things that sometimes, makes me feel uncomfortable. During these 7 years, I subtly felt the help I needed to conquer this awkwardness towards family gatherings. Now, relatives ask me where’s Sam and how he is rather than ask me how I am. I guess, that’s just how things go if you’re together for quite some time. Before I feel insecure about myself so much, now, I feel comfortable with my body. I used to be really thin (or skinny) that relatives tease me that I don’t eat. Then, I gained weight especially during thesis days wherein I really indulged in food. Pressure from family came that I needed to shed weight. I tried however, it reached the point that I felt comfortable being this way. I’m happy that Sam reminds me to just be healthier and from then on, my self-love rose. Well, I struggled with low self-esteem and self-confidence for another set of reasons and maybe another blog post. Now, I’m just happy with how my body is and how I am today. That’s something I treasure ever since we got together. Along with the imperfections and flaws that every person has, one needs to learn their flaws and imperfections too. Sometimes, we find it hard to do and just point out the flaws we see in others. However, when we recognize our own flaws, it helps us become stronger and wiser. It helps when you find someone who accepts you just for who you are. Of course, it’s great if it’s mutual acceptance. Through the years, I built up walls to protect myself. From the ill experiences I gathered through the years, it became my defense mechanism. When someone hurts me in one way or another, I stopped talking to them. Nowadays, it’s easier. Just block off on social media so you won’t see their posts. But before I get carried away, I’ve learned to accept my imperfections and make an armor out of it. It’s not that easy to let someone through all your walls and barriers. But if that someone accepts everything about you, then it’s worth it. When it comes to being together for so long, both develop a certain trait and unique characteristics that may be odd for some. Earlier, people feel shy about farting when their significant other (SO) is around and still excuse themselves. However, I learned that as the years go by, you just say it outright. Or even do things right there. When you feel like farting, you just do it (if you’re dating that long). Yet, when you’re a new couple, you still feel timid and think that your partner may feel disgusted or what. In other instances, I learned that being straightforward or honest just does the job. If I feel hungry if we’re outside, I say it. But truth be told, it’s not always like this. I do refuse to say things too, at times. Why? My anxiety prevents me from doing so. Whenever I feel like I need to say something, I wrestle with the idea of saying it in my mind. Also me: No, I’m not. I’m wrestling with different things in my mind and I feel shy sharing it to you. I don’t want to be a burden. That is the truth about battling anxiety. There’s always that constant battles whether or not do one thing. I know it’s negative on my part and I’m still learning so much about coping up with it. Luckily, it’s great to find someone who’s patient and always there when you need them the most. I swear, one of the hardest things to overcome in any aspect in life. People encounter different insecurities that make them think small of themselves. Before, I felt insecure about my skin – I got the morena skin tone. I dreamt of getting lighter skin however, I learned that loving my skin tone more helps me feel more confident about myself. Turning that morena skin tone into a unique feature about yourself helps you overcome anything that life throws at you. It’s just like having an armor without putting anything on your body. I learned the hard way and now, I’m sharing it to you. Continue doing and performing your best and you’re fine. Just remember that you’re different and unique from another person. I guess that’s my story. What’s yours? I want to hear about it! P.S. Advance Happy Valentine’s Day! Congratulations! That is quite an achievement to be together that long. I’m happy for both of you. I agree with most of the things that you shared. I’m glad that you’ve reached that point when you are honest with each other and very comfortable already.